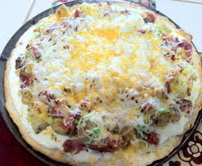 Baked Potato Pizza from Gina Pierson at AllRecipes makes a great party dish, but we enjoyed as our main dish at supper. It reminds me of the loaded fries we had once in St. Louis and haven't been able to find since, so I was on Cloud 9 when I found this recipe. If you try it out, be sure to take the advice of the reviewers and substitute 1/2 cup of ranch dressing for 1/2 cup of the sour cream to add flavor. I used a super cheap Great Value pizza crust mix, and it was awesome. Don't feel like you need to spend a lot on the crust, as the Great Value crust was perfect.